Pseudomonas aeruginosa chronic lung infections are the major cause of morbidity and mortality associated with cystic fibrosis. For many years, the consensus was that cystic fibrosis patients acquire P. aeruginosa from the environment, and hence harbour their own individual clones. However, in the past 15 yrs the emergence of transmissible strains, in some cases associated with greater morbidity and increased antimicrobial resistance, has changed the way that many clinics treat their patients. Here we provide a summary of reported transmissible strains in the UK, other parts of Europe, Australia and North America. In particular, we discuss the prevalence, epidemiology, unusual genotypic and phenotypic features, and virulence of the most intensively studied transmissible strain, the Liverpool epidemic strain. We also discuss the clinical impact of transmissible strains, in particular the diagnostic and infection control approaches adopted to counter their spread. Genomic analysis carried out so far has provided little evidence that transmissibility is due to shared genetic characteristics between different strains. Previous experiences with transmissible strains should help us to learn lessons for the future. In particular, there is a clear need for strain surveillance if emerging problem strains are to be detected before they are widely transmitted. Cystic fibrosis (CF) is the most common life-threatening, genetically inherited disorder among Caucasians. Although patient management and infection control policies have increased median predicted life expectancies close to 40 yrs, with continuing improvements expected (www.cftrust.org.uk), most patients eventually succumb to morbidity and mortality due primarily to chronic bacterial infections of the lung. The most common and important CF pathogen is Pseudomonas aeruginosa , which will ultimately infect the majority of CF patients, and adversely affects lung function and survival [2–6]. In recent years there have been reports of success with early eradication therapy for P. aeruginosa [7, 8], a strategy with considerable potential to delay the onset of chronic infections. In order to implement such strategies successfully, it is important to have effective microbiological screening. Once established, chronic CF lung infections with P. aeruginosa are impossible to eradicate, and are associated with phenotypic diversification of populations, typified by the appearance of colonies exhibiting a mucoid phenotype . P. aeruginosa is often described as ubiquitous in the environment. A common feature of the genus Pseudomonas is metabolic adaptability, their relatively large genomes enabling the organisms to thrive in a range of niches . It is generally accepted that the most common source of infection of CF patients with P. aeruginosa is “the environment”, although acquisition pathways are difficult to establish. There have been examples of multiple CF patients carrying the same strain, such as the relatively abundant clone C strain, which is highly prevalent among natural water and CF-derived samples , but CF patients generally carry their own unrelated strain, the original source of which is unknown. There have been considerable advances in the study of P. aeruginosa population structures, comparing isolates from diverse environmental and human sources [12–18]. These studies have suggested that P. aeruginosa population structure is a non-clonal, epidemic structure with several punctuations or peaks that represent dominant clones . There is little evidence of markers that could unequivocally be labelled as CF-associated and the source of strains infecting CF patients remains unclear. However, a study by van Mansfeld et al. investigated P. aeruginosa population genetics from different patient populations and found that two major CF genotypes were unique to the CF population suggesting host specificity in these strains. First indications that acquisition of “unique” strains from the environment may not be the only important route of transmission for P. aeruginosa infections of CF patients emerged in the 1980s, when a study of Danish patients suggested epidemic spread, based on antibiograms . Although, there had been indications previously that siblings could share common strains [21–23], the general consensus was that cross infection of CF patients with P. aeruginosa was not a major issue. In the 1990s, attention focused more on another important group of CF pathogens, the Burkholderia cepacia complex (Bcc), for which the evidence of transmissibility was much more clear-cut. Although members of this group of closely related bacteria are less prevalent in CF patients, infections can follow a serious and often rapid decline in health, referred to as “cepacia syndrome” . Analysis of samples isolated from Bcc-infected patients attending CF centres in the UK revealed that the main cause of increased infections was a single Burkholderia cenocepacia strain from 1989 referred to as ET12 . Strict segregation policies were key in reducing the spread of this transmissible strain . Since the initial reports in the mid-1980s, putative transmissible P. aeruginosa strains have slowly appeared on the radar of CF clinicians and are now impacting on clinical decisions and infection control policies around the world. A timeline of important publications and findings is shown in figure 1. Timeline of major events reporting transmissible and putative transmissible strains of Pseudomonas aeruginosa. B. cenocepacia: Burkholderia cenocepacia LES: Liverpool epidemic strain; MES: Manchester epidemic strain; AES: Australian epidemic strain; Mid1: Midlands strain. The terminology associated with transmissible strains of P. aeruginosa can be confusing and inconsistent. This stems mostly from the fact that actual transmission is very difficult to demonstrate unequivocally. The presence of shared strains among multiple patients at a CF centre does not by itself prove transmission because there are other plausible explanations. For example, some strains are naturally more abundant and hence likely to be acquired by more patients. In addition, multiple patients could acquire the same strain from a common environmental source. Hence, what constitutes a transmissible or “epidemic” strain is unclear. In this review, we propose the use of the term “epidemic” only when it appears in established strain names such as the Liverpool epidemic strain (LES) or the Australian epidemic strain (AES). The term “transmissible” will only be used for strains where there is considerable literature to support the use of this term, or where segregation policies have resulted in a reduction in the number of infected patients (LES, AES-1, Manchester epidemic strain (MES) and DK2). Other proposed transmissible strains will be termed “putative transmissible strains” and strains only identified in one study will be termed “clusters” or “clusters of related strains”. The first evidence for spread of a strain of P. aeruginosa based on molecular analysis came in the mid-1990s, when ceftazidime resistance emerged among isolates from CF patients in a paediatric unit in Liverpool . Macrorestriction analysis using pulsed-field gel electrophoresis (PFGE) and flagellin genotyping were used to confirm that 55 patients were infected with the same strain, now known as the LES. A study of adult patients in Liverpool several years later indicated infection by the LES in 63 of 80 P. aeruginosa-positive patients , and it soon became apparent that the strain was not restricted to Liverpool. In a survey of 849 isolates from CF patients attending 31 CF centres in England and Wales, the LES was identified as the most prevalent single strain of P. aeruginosa, accounting for 11% of isolates, and present in 48% of the centres surveyed . Although other studies have reported the presence of the LES in CF centres in Sheffield , the West Midlands , Manchester  and, more recently, Belfast , there are a number of other UK CF centres where LES is present but further details have not been published. Although the LES was not found in a general survey of P. aeruginosa isolates, mostly from mainland Europe , the LES has recently been reported as infecting CF patients in multiple centres in Ontario, Canada . 22% of the 323 P. aeruginosa-infected patients included in the Ontario study were infected with the LES. However, there are currently no published investigations regarding the presence or absence of the LES in non-clinical environments. In addition to transmissibility, a number of interesting characteristics have been associated with the LES. The strain can cause superinfection of patients previously chronically infected with a different strain of P. aeruginosa . In addition, the LES has caused respiratory infections of both non-CF parents of the same CF patient , with infections lasting for over 5 yrs (unpublished data). The LES has also been associated with transmission to a pet cat . It has also been shown that the LES can survive for prolonged periods on dry surfaces surrounding infected patients and, over the short term, in air samples . There is now considerable evidence that patients infected with the LES face a worse prognosis. In Liverpool, cohorts of CF patients infected with either 1) the LES or 2) another P. aeruginosa strain, were compared . Patients chronically infected with the LES had a greater annual loss of lung function, reduced forced expiratory volume in 1 s and greater deterioration in nutritional status. The LES has also been associated with cases of acute renal failure  and pleural empyema . In the recent study of Ontario CF patients, comparing those infected with the LES to those infected with unique strains, although no differences in decline in lung function were detected, the 3-yr rate of death or need for lung transplantation was greater in those infected with the LES (18.6% compared with 8.7%) . A study demonstrated that LES isolates are significantly more antibiotic resistant than other P. aeruginosa CF isolates and that resistance in LES isolates is more likely to develop over time . In contrast, Jones et al. reported the findings of an 8-yr prospective study investigating the clinical outcomes of patients infected with transmissible strains compared to those with sporadic strains. No significant differences were found. However, the transmissible strains group consisted of a mixture of two strains, the MES (n=21) and the LES (n=7), with the LES in a minority. There have been a number of studies aimed at identifying characteristics of the LES that might explain its unusual clinical behaviour. Some LES isolates have an abnormal quorum sensing (QS)-related phenotype characterised by the over-production of pyocyanin (OP phenotype), but also leading to higher levels of other virulence-related exoproducts . Given the potential role of QS in pathogenicity in CF infections , this characteristic, not reported with any other environmental or clinical isolates of P. aeruginosa, may contribute to the greater morbidity observed with this strain. Indeed there is some evidence linking the phenotype to CF patient exacerbation . However, since the accumulation of mutations with consequent generation of population diversity is a feature of P. aeruginosa CF lung infections, and QS-defective lasR mutants are common in such infections, it is not surprising that LES populations isolated from CF patients are generally a mixture of isolates with the OP phenotype and isolates not exhibiting the phenotype [46, 47]. LESB58 is the earliest LES isolate identified (from 1988) and the genome was sequenced in 2009. This revealed the presence of a number of genomic islands and prophages (table 1). Studies in infection models showed that such mobile genetic elements may be important in establishing infection (table 2). LESB58 out competes both PAO1 and PA14 in a rat model of chronic lung infection by using the unusual tactic of limited dissemination [59, 60]. Signature-tagged mutagenesis (STM) was used to demonstrate that novel prophage and genomic island regions play critical roles in the competitiveness of P. aeruginosa LESB58 in the rat model . STM mutations in specific genes within either prophage 2, 3 or 5 were found to cause a 7- to 58-fold decrease in competitiveness, thus suggesting that these prophages could play an important role in the establishment of infection in this model . LES phages can be detected as free phages in culture  and directly from patient sputum . P. aeruginosa bacteriophages have been described as having mosaic genomes  and certainly there is evidence to demonstrate recombination between prophages in the LES genome, as well as to other phages. Phages are able to transfer “moron” genes that could encode virulence factors. Furthermore, many temperate phages allow indirect transfer of bacterial genes by phage transduction . The effect of bacteriophages on populations is, as yet, unclear, but it has been shown that bacteriophages can drive diversification . Extensive genome plasticity has been reported for P. aeruginosa clinical isolates, with phage sequences contributing to horizontal gene transfer and sequence diversity . Furthermore, the presence of bacteriophages has been shown to present difficulties for some typing methods. Some LES isolates from chronic CF lung infection display genomic instability and can have dramatically different PFGE profiles due to prophage or genomic island deletions. This poses a challenging task for diagnostic laboratories to consistently identify this important transmissible strain . In an acute mouse model, different LES subtypes (table 2) displayed a range of virulence in a mouse respiratory infection model (LES431>LESB65>LES400>LESB58), with LES431 being by far the most virulent . It is clear that different isolates of the LES show variations in pathogenic behaviour. This diversification may be important in the emergence of subtypes better able to exhibit transmissibility, which may be due to improved ability to colonise, ability to outcompete and replace established P. aeruginosa (superinfection), enhanced survival/persistence in the environment, or a combination of these. It is known that P. aeruginosa has the potential to cause chronic or acute infections, and that different factors are expressed during these two types of infection [68, 69]. However, the mechanisms and specific genetic determinants involved in pathotype variability, especially in relation to transmissibility, are not well understood. The process of establishment of P. aeruginosa in the CF lung has been the subject of considerable study and involves a number of genetic and phenotypic adaptations, including the switch to a mucoid phenotype  and the adoption of a biofilm lifestyle . Nevertheless, chronic infections may persist for many years following establishment, and the resultant evolutionary dynamics and diversity of P. aeruginosa within chronic infections are not well understood. Sequential isolates from infections of CF patients accumulate particular mutations . This has been interpreted as suggesting adaptation to the CF lung leading to either reduced  or altered virulence , as well as enhanced antimicrobial resistance . In particular, mutations in the central QS regulator lasR (controlling numerous virulence traits) and efflux pump-associated genes such as mexZ (important in antimicrobial susceptibility) are commonly identified [71, 73]. The phenotypic and genotypic diversity of P. aeruginosa LES populations has been studied [45, 47]. Changes in the composition of the P. aeruginosa LES populations occur during short periods of intense selective pressure, demonstrating the versatility and adaptability of this organism . More recently, this approach has been applied to a set of 10 adult CF patients, each chronically infected with the LES. Sputum samples were obtained from each patient on multiple occasions, during regular monitoring and pulmonary exacerbation. The LES populations from this group of chronically infected CF patients exhibited high phenotypic/genotypic diversity . This study provided a new picture of chronic P. aeruginosa infections. It is now clear that such populations can be incredibly diverse and inhabit a complex environment within the CF lung, which supports the maintenance of such varied populations [45, 74]. In addition, it was found that the greatest contribution to diversity was found within individual samples, rather than between samples or between patients, and that the populations are dynamic . An important consequence of such diversity within chronic P. aeruginosa infections is the potential that it provides as a reservoir to harbour minority virulence-related traits , allowing for the co-existence of multiple pathotypes. In the case of transmissible strains, these would include the key ability to transmit. Furthermore, great diversity in the antimicrobial susceptibility profiles was identified within the population, thereby reinforcing the notion that diagnostics based on a single isolate, or even a few, may not represent the population as a whole. Although it is widely accepted that population divergence occurs during chronic infection, it has been suggested that this is not necessarily associated with a decrease in virulence. Bragonzi et al. showed that, although early isolates had an enhanced ability to cause mortality in a mouse model (acute virulence), no reduction in the ability to cause chronic infection was observed in late isolates, suggesting that adaptation occurs in favour of persistence and against invasive phenotypes. Our observations with the virulence-related OP phenotype of LES suggest that, despite the likely metabolic burden involved, this phenotype persists for long periods within the infecting bacterial populations [45, 46]. Mutations and variation in many virulence-associated and antibiotic resistance genes have been identified in many P. aeruginosa infections [71, 76, 77]. A common adaptation to the CF airway is the accumulation of lasR mutants (QS deficient) and it has been shown that such a mutation can confer a growth advantage on some carbon and nitrogen sources and increased beta-lactamase activity, thereby suggesting potential beneficial effects of this common downregulation . In addition, it has been shown that the proportion of QS deficient isolates in the population can vary both within and between patients, thereby suggesting that the selection pressures exerted on the P. aeruginosa population can be diverse in the CF lung . Although in chronic pulmonary obstructive disorder P. aeruginosa infection is not well characterised, there is evidence for intraclonal microevolution and genetic adaptation . A number of transmissible strains have been reported in Australia. The first was initially identified in Melbourne and linked with the deaths of five children from severe CF lung disease and increased hospitalisation . Another report from a study of CF patients in Sydney found that half the patients studied were infected with a single strain of P. aeruginosa, referred to as pulsotype I , but subsequently identified as being the same as the epidemic strain in Melbourne . This strain, also present in both adult and paediatric units in Brisbane , is now known as AES-1. A second putative transmissible strain, AES-2, initially known as pulsotype II, is more common in Brisbane , and has been associated with younger patients, significantly lower spirometry and increased antibiotic resistance, when compared with other strains of P. aeruginosa . Other small clusters of related strains were also identified. In vitro studies have suggested that both AES-1 and AES-2 show increased production of virulence factors, such as protease IV, elastase and alkaline protease, than other non-epidemic strain CF isolates [71, 85]. A third putative transmissible strain, AES-3, is the most common in Tasmania, and has been linked with increased virulence in patients aged >15 yrs . More recently, a study of isolates from adult CF patients in Sydney reported that approximately half of the patients were infected by clusters of related strains, adding S-1 and S-2 to the AES-1 and AES-2 clones reported previously . Strain AES-1 was the most common (38% of patients), followed by AES-2 (5%). Because strains S-1 and S-2 infected only 5% and 3% of patients respectively, and had not been reported previously in larger numbers elsewhere, their designation as transmissible strains is, at the moment, questionable. Patients infected with clustered (AES-1, AES-2, S-1 or S-2) had a higher median number of days of hospitalisation and more frequent exacerbations . Gene expression characteristics during biofilm and planktonic growth have been analysed for strains AES-1  and AES-2 , showing enhanced biofilm formation and an upregulated type III secretion system genes respectively. Multilocus sequence typing (MLST) data indicates that AES-2 represents a unique sequence type (ST) that, so far, has only been identified in Australian CF patients . Two further studies in Canada  and the Netherlands  did not identify any of the Australian CF strains (AES-1, AES-2 and AES-3). However, the AES-1 ST has been matched to a blood isolate from the Czech Republic  and a study based in New Zealand reported the presence of the Australian strains (AES-1 and AES-2) among a CF strain collection . Recently, details of a diagnostic PCR test for the AES-1 strain has been published , thus making it easier for CF centres elsewhere to screen their isolates. In addition, the genome sequence of AES-1 is now available . As well as the earliest report of a putative transmissible strain , there have been a number of other interesting studies from groups in Denmark. One study showed a cross infection rate of 100% following a 1-week winter camp attended by CF patients with mixed infection status . It has been widely suggested that infection status should be a major consideration for CF patient holiday camps. Indeed, these are often avoided altogether. In a study of P. aeruginosa isolates from CF patients attending two major Dutch CF centres, although a high level of strain diversity was reported, two major clusters were identified among chronically infected patients, and the authors presented evidence that the strains were transmissible . Smaller clusters of isolates were also identified. More recently, the evolutionary dynamics of one of these dominant clones (DK2) was analysed using genome sequencing approaches . The genomes of 12 DK2 isolates from six different patients, spanning the period 1973–2008, were compared. Evolutionary trees based on single nucleotide polymorphism variations indicated that important mutations accumulated during the early years of infection (pre-1979), after which there was only very limited diversification. The authors suggested that despite the complexity and diversity of the CF lung environment, a homogeneous population of DK2 dominated . This appears to contradict the evidence reported for the LES, based on mostly phenotypic characteristics . However, it should be noted that most sequencing studies have thus far been based on very limited numbers of isolates [71, 98] and that there may be variations between strains and between patients. In addition, the emergence of bacterial population members with the hypermutable phenotype may play an important role [99, 100]. It is clear that we need more studies aimed at exploiting the new sequencing technologies to improve our understanding of P. aeruginosa population behaviour during CF infections. In a study of CF children attending summer camps in the Netherlands in 2001, the presence of a cluster of P. aeruginosa implicated in transmission was identified using amplified fragment length polymorphism (AFLP) typing . Multiple shared genotypes were detected in this investigation. This study contrasted with a similar survey in the previous decade, which found no evidence for transmission among patients at such camps . This finding led to a strict segregation routine and prompted a survey of CF isolates using MLST . The survey revealed the presence of two dominant MLST types, ST406 and ST497, found in 15% and 5% of the patients, respectively. In all, 60% of the patients screened harboured a strain found in at least two other patients . The cluster from the earlier summer camp study was identified as ST-406 which, interestingly, was absent from patients >31 yrs of age. In contrast, strain ST-497 was found mostly in older patients. Other putative transmissible strains have also been reported in mainland Europe. In Norway, researchers identified a large cluster of 27 patients that shared a single strain. There was a significant association between patients infected with this strain and attendance at summer camps and training courses thereby suggesting cross infection . A report from Ontario using MLST typing highlighted not only the presence of the LES (strain A) among CF patients, but also strain B (ST-439), not previously described as infecting CF patients . Unlike patients infected with the LES (strain A), patients infected with the ST-439 strain did not have a greater 3-yr risk of death or lung transplantation . The same laboratory published an earlier report highlighting the possibility of a transmissible strain of P. aeruginosa in Canada , but to date no other groups have reported putative transmissible strains of P. aeruginosa among CF patients in North America. In 2002, Speert et al. performed a retrospective study in British Columbia and concluded that patients were at “extremely low risk” of infection from transmissible strains and therefore segregation was not warranted. Although the LES is the most common transmissible strain in the UK, other putative transmissible strains have been identified. These include the Midlands1 (Mid1) strain and the Manchester epidemic strain (MES) . In the mid-2000s, the Mid1 strain was found to be the second most common strain in the UK (10% of all isolates tested) . A further study of patients in one UK CF centre revealed that 30% of the patients harboured the Mid1 strain and that age at time of referral seemed to be a prediction factor . The strain was not highly resistant to antibiotics and infection did not appear to be associated with increased morbidity . Despite its high prevalence in the UK, the strain has remained relatively unexplored. The MES was first reported in 2001 in a CF unit in Manchester. The strain was shared by 14% of all the patients and was highly resistant to many anti-pseudomonal antibiotics . Although simple infection control measures were ineffective at controlling the spread of the strain among patients at the centre, a strict patient segregation policy was effective . A cluster of 18 genes was identified and designated the MA island. Possible virulence determinants, such as a gene showing similarity with the Vibrio cholerae toxin gene were identified . However a role for this putative toxin in pathogenesis has, as yet, not been demonstrated . Inflammatory markers have been compared between patients with sporadic P. aeruginosa and patients with the MES, showing that there was no significant difference between the two groups. This suggests that infection with the MES is not associated with a heightened inflammatory response . However, there is evidence from the same CF centre that infection with a transmissible strain is associated with healthcare need and antibiotic usage . The mode of transmission could be via airborne dissemination, as a study performed during a cross infection outbreak identified evidence of contamination of room air after patient use . Other clusters of related strains have been reported regionally in the UK including the Stoke/Trent strain , Sheffield strain  and Leeds strain . Little is known about these strains, particularly whether carriage is associated with increased morbidity. P. aeruginosa clone C has an impressively wide distribution in both clinical and natural environments. It has been identified in CF patients in Canada, England, France and Germany . Characteristics such as biofilm formation and antibiotic resistance are not enhanced and, as yet, there is little indication as to the reasons behind this strain's worldwide success in diverse habitats . This unusual strain also appears to have broad pathogenic ability, having been identified in infections of the urinary tract and peritoneal dialysis fluid . Recently, sophisticated approaches, including genome sequencing, were used to study the evolution of both clone C and another abundant P. aeruginosa lineage (PA14), indicating differences between patients . However, it is not clear whether the prevalence of such strain types in CF is attributable to transmissibility or merely a reflection of their environmental abundance. DO TRANSMISSIBLE STRAINS SHARE COMMON GENOMIC FEATURES? Genome sequences have only been published for a limited number of transmissible strains. A comparison between the genomes of two of these, the LES  and MES , with the genome of strain PAO1 is shown in figure 2. Comparison of the Liverpool epidemic strain (LES; LESB58, upper) and Manchester epidemic strain (MES; C3379, lower) genomes to PAO1 (central) using Artemis comparison tool. Regions of homology are shown in red and inverted homologous regions are shown in blue. Gaps represent insertion/deletions in the genomes. The key genomic islands and prophages are labelled. Genome lengths in Mb are shown. The LES and MES strains, like all P. aeruginosa strains, share a core genome which accounts for ∼90% of the genome. In terms of the accessory genome, the two strains share little in common apart from a Pf1-like prophage present in many P. aeruginosa genomes, including PAO1. 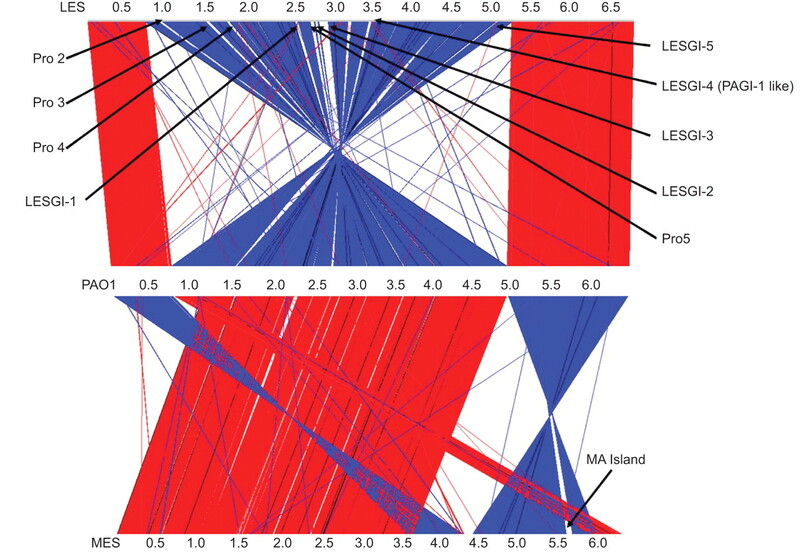 The MES genome carries one other major genomic island insertion, the MA island, whereas the LES genome harbours several genomic islands and prophages (fig. 2; table 1). Some genetic analysis of the Mid1 strain has been published . Mid1 and LES share the same serotype (O6) and carry the more unusual pyoverdine biosynthesis and receptor genes (type III) but differ in flagellin types . On the basis of strain typing by use of an ArrayTube chip, the Mid1 strain was assigned to the same group as strains from a German intensive care unit and one strain found in a German river, and the LES belonged to the same type as an isolate from a patient with bacteraemia in a Swiss clinic . The Netherlands strains were not genetically linked to any other CF epidemic strains by MLST . The AES-1 and DK2 show very little similarity in their accessory genome to the other sequenced transmissible strains [96, 98]. It has been suggested that virulence in P. aeruginosa is combinatorial. Since there is little evidence to suggest a single factor that promotes transmissibility, it is likely that such characteristics arise from different combinations of factors, specific to each strain . However, genome sequencing of more transmissible strains will allow further insight into this hypothesis. Although diagnostic identification of P. aeruginosa, generally using culture from patient sputum, cough swab or bronchial lavage samples, is widespread in CF units, methods to discriminate between different strains are much less commonly used. In the absence of bacterial typing to identify individual strains, it is unlikely that any transmissible strains within a unit will be detected. Where methods have been used, a wide variety of techniques have been applied, including macrorestriction analysis coupled with PFGE , random amplified polymorphic DNA  profiling, repetitive sequence PCR , ribotyping or AFLP . These techniques share the disadvantages that they are poorly portable between laboratories, and may be poorly applicable to long-term chronic infections where bacterial populations diversify, sometimes due to large genomic events . Such approaches may enable individual units to detect a transmissible strain, but units elsewhere would find it difficult to determine whether any of their patients harboured this strain. Other methods, such as MLST  or ArrayTube typing , are more portable but can be expensive. In addition, variable number tandem repeats [118, 119] and other small nucleotide polymorphism-based typing approaches have been used [19, 120]. For some transmissible strains, specific PCR assays have been developed, thus enabling cheap and simple screening to be carried out. For the LES, diagnostic tests were originally developed using suppression subtractive hybridisation (SSH) to identify strain-specific sequences [27, 49, 50, 121]. Tests for other epidemic strains (MES , Mid1  and AES-1 ) have also been developed using a similar approach. With the rise in rapid sequencing and associated decrease in cost, it is likely that methods such as SSH will eventually be entirely superseded by sequencing and bioinformatics analysis. In the Liverpool CF units, a multiplex PCR test for three transmissible and suggested transmissible strains (LES, Mid1 and MES) is used routinely. However, strain-specific PCR assays are not without limitations, as false-positives and -negatives for some markers have been reported . As a consequence of this, it is suggested that two PCR markers are used to identify the LES . A key uniting factor with all of these strains is that they were widespread before their identification, which reinforces the importance of screening for emerging strains on a regular basis. For the past decade, the need for segregation of CF patients harbouring transmissible strains has been a contentious issue. However, Festini et al. highlight the difficulty of adequately controlled studies in this area and many reports are either retrospective or based on individual centre experience. In Liverpool, since segregation was introduced using molecular-based identification, there have been no new cases of LES infections among patients attending the children's CF unit , and the prevalence of LES-positive patients attending the adult unit has declined considerably . Effective segregation measures have also been reported elsewhere in the UK . In Australia, following segregation of patients with the AES-1, the number of patients infected with the strain decreased by a third, while the overall number infected with P. aeruginosa remained unchanged [126, 127]. A number of centres have reported no evidence of transmission of P. aeruginosa despite repeated environmental and patient-based studies, and they therefore do not recommend segregation based on P. aeruginosa colonisation status [105, 128, 129]. It is clear that some strains have been associated with greater resistance to antibiotics [26, 41, 43], increased treatment requirements [38, 91], worsening lung function and nutritional state  and greater mortality [22, 33, 37]. Prevention of infection with these strains is therefore a clear clinical goal. For other widespread or transmissible strains, the evidence may be less clear-cut, but there would still be a case for segregating infected patients from patients who are Pseudomonas free. Since genotypic/phenotypic evidence suggests that transmissible strains share little in common, it is perhaps wise that segregation policies for Pseudomonas-positive individuals, should be considered on a strain-specific basis. Although many have been reluctant to accept the idea, and their presence among CF patient cohorts is far from universal, the evidence for transmissible strains of P. aeruginosa in the context of respiratory infections in CF units is compelling and increasing. However, this does provide a puzzling scenario. Typing studies were performed before the 1990s and it was accepted that transmission was mainly confined to between siblings. This begs the question: were earlier studies limited by the available typing technology or are transmissible P. aeruginosa strains a relatively new phenomenon? The genotypic, phenotypic and clinical data available for the best studied of these strains (LES, MES, AES-1 and DK2) strongly suggests that their specialist abilities may be due to different factors. For example, genome sequence comparisons indicate little in common in the accessory genomes of these strains, and there have been no reports of other transmissible strains sharing the novel OP phenotype exhibited by the LES. It has been shown in model systems that P. aeruginosa virulence can be combinatorial , with different strains evolving similar pathogenic abilities by assembling different combinations of pathogenicity-related genes. In the context of transmissibility, it is tempting to suggest that this ability has also been acquired in different ways by different strains. However, there is still much that we do not understand about the mechanisms underlying transmissibility, and there are considerable challenges in identifying those factors relating specifically to transmissible strains, rather than applying more generally to all P. aeruginosa infections in CF. In the short term, it is important that such strains, including emerging transmissible strains, are detected, which can only be achieved by regular surveillance using sophisticated molecular tests. In the longer term, closer analysis of such strains using the latest sequencing and other technologies may reveal common themes contributing to their success, enabling us to design better strategies to counter them. We acknowledge the support of the UK National Institute for Health Research.
. Persistent and aggressive bacteria in the lungs of cystic fibrosis children. Br Med Bull 2002; 61: 81–96.
. Mucoid Pseudomonas aeruginosa is a marker of poor survival in cystic fibrosis. Pediatr Pulmonol 1992; 12: 158–161.
. Changing epidemiology of Pseudomonas aeruginosa infection in Danish cystic fibrosis patients (1974–1995). Pediatr Pulmonol 1999; 28: 159–166.
. Pulmonary function and clinical course in patients with cystic fibrosis after pulmonary colonization with Pseudomonas aeruginosa. J Pediatr 1990; 116: 714–719.
. Acceleration of lung disease in children with cystic fibrosis after Pseudomonas aeruginosa acquisition. Pediatr Pulmonol 2001; 32: 277–287.
. Eradication of early Pseudomonas infection in cystic fibrosis. Chron Respir Dis 2009; 6: 99–107.
. Early aggressive eradication therapy for intermittent Pseudomonas aeruginosa airway colonization in cystic fibrosis patients: 15 years experience. J Cystic Fibros 2008; 7: 523–530.
. Microbial pathogenesis in cystic fibrosis: mucoid Pseudomonas aeruginosa and Burkholderia cepacia. Microbiol Rev 1996; 60: 539–574.
. Pseudomonas genomes: diverse and adaptable. FEMS Microbiol Rev 2011; 35: 652–680.
. Worldwide distribution of Pseudomonas aeruginosa clone C strains in the aquatic environment and cystic fibrosis patients. Environ Microbiol 2005; 7: 1029–1038.
. Functional genomics of Pseudomonas aeruginosa to identify habitat-specific determinants of pathogenicity. Int J Med Microbiol 2007; 297: 615–623.
. Population structure of Pseudomonas aeruginosa. Proc Nat Acad Sci USA 2007; 104: 8101–8106.
. Pseudomonas aeruginosa displays an epidemic population structure. Environ Microbiol 2002; 4: 898–911.
. Global Pseudomonas aeruginosa biodiversity as reflected in a Belgian river. Environ Microbiol 2005; 7: 969–980.
. Development of a multilocus sequence typing scheme for the opportunistic pathogen Pseudomonas aeruginosa. J Clin Microbiol 2004; 42: 5644–5649.
. Population structure of Pseudomonas aeruginosa from five Mediterranean countries: evidence for frequent recombination and epidemic occurrence of CC235. PLoS One 2011; 6: e25617.
. The population genetics of Pseudomonas aeruginosa isolates from different patient populations exhibits high-level host specificity. PLoS One 2010; 5: e13482.
. An epidemic spread of multiresistant Pseudomonas aeruginosa in a cystic fibrosis centre. J Antimicrob Chemother 1986; 17: 505–516.
. Pseudomonas aeruginosa isolates: comparisons of isolates from campers and from sibling pairs with cystic fibrosis. Pediatr Pulmonol 1985; 1: 40–45.
. Genome fingerprinting of Pseudomonas aeruginosa indicates colonization of cystic fibrosis siblings with closely related strains. J Clin Microbiol 1988; 26: 1973–1977.
. Pseudomonas aeruginosa cross-colonization and persistence in patients with cystic fibrosis. Use of a DNA probe. Epidemiol Infect 1989; 102: 205–214.
. Evolving epidemiology of Pseudomonas aeruginosa and the Burkholderia cepacia complex in cystic fibrosis lung infection. Future Microbiol 2007; 2: 153–164.
. Evidence for transmission of Pseudomonas cepacia by social contact in cystic fibrosis. Lancet 1993; 342: 15–19.
. Spread of beta-lactam-resistant Pseudomonas aeruginosa in a cystic fibrosis clinic. Lancet 1996; 348: 639–642.
. PCR-based detection of a cystic fibrosis epidemic strain of Pseudomonas aeruginosa. Mol Diagn 2003; 7: 195–200.
. Identification and characterization of transmissible Pseudomonas aeruginosa strains in cystic fibrosis patients in England and Wales. J Med Microbiol 2004; 53: 609–615.
. Genotyping of Pseudomonas aeruginosa in cystic fibrosis suggests need for segregation. J Cystic Fibros 2004; 3: 37–44.
. Factors associated with infection by Pseudomonas aeruginosa in adult cystic fibrosis. Eur Respir J 2005; 26: 651–656.
. Prospective surveillance for Pseudomonas aeruginosa cross-infection at a cystic fibrosis center. Am J Respir Crit Care Med 2005; 171: 257–260.
. Molecular conservation within LES9F and PS21 Liverpool epidemic strain (LES) markers in wild-type clinical Pseudomonas aeruginosa isolated from the sputum of adult patients with cystic fibrosis. Br J Biomed Sci 2010; 67: 87–88.
. Infection with transmissible strains of Pseudomonas aeruginosa and clinical outcomes in adults with cystic fibrosis. JAMA 2010; 304: 2145–2153.
. Superinfection with a transmissible strain of Pseudomonas aeruginosa in adults with cystic fibrosis chronically colonised by P. aeruginosa. Lancet 2001; 358: 558–560.
. Spread of an epidemic Pseudomonas aeruginosa strain from a patient with cystic fibrosis (CF) to non-CF relatives. Thorax 2002; 57: 559–560.
. Transmission of Pseudomonas aeruginosa epidemic strain from a patient with cystic fibrosis to a pet cat. Thorax 2008; 63: 839–840.
. Environmental contamination with an epidemic strain of Pseudomonas aeruginosa in a Liverpool cystic fibrosis centre, and study of its survival on dry surfaces. J Hosp Infect 2005; 59: 102–107.
. Increased morbidity associated with chronic infection by an epidemic Pseudomonas aeruginosa strain in CF patients. Thorax 2004; 59: 334–336.
. Acute renal failure in CF patients chronically infected by the Liverpool epidemic Pseudomonas aeruginosa strain (LES). J Cystic Fibros 2005; 4: 197–201.
. Empyema due to a highly transmissible Pseudomonas aeruginosa strain in an adult cystic fibrosis patient. J Med Microbiol 2010; 59: 614–616.
. Increasing resistance of the Liverpool epidemic strain (LES) of Pseudomonas aeruginosa (Psa) to antibiotics in cystic fibrosis (CF) – a cause for concern? J Cystic Fibros 2011; [Epub ahead of print DOI: 10.1016/j.jcf.2011.11.004].
. Clinical outcome for cystic fibrosis patients infected with transmissible Pseudomonas aeruginosa: an 8-year prospective study. Chest 2010; 137: 1405–1409.
. A cystic fibrosis epidemic strain of Pseudomonas aeruginosa displays enhanced virulence and antimicrobial resistance. J Bacteriol 2005; 187: 4908–4920.
. The role of quorum sensing in chronic cystic fibrosis Pseudomonas aeruginosa infections. FEMS Microbiol Lett 2009; 290: 1–9.
. Pseudomonas aeruginosa population diversity and turnover in cystic fibrosis chronic infections. Am J Respir Critical Care Med 2011; 183: 1674–1679.
. Fluctuations in phenotypes and genotypes within populations of Pseudomonas aeruginosa in the cystic fibrosis lung during pulmonary exacerbations. J Med Microbiol 2010; 59: 472–481.
. Newly introduced genomic prophage islands are critical determinants of in vivo competitiveness in the Liverpool Epidemic Strain of Pseudomonas aeruginosa. Genome Res 2009; 19: 12–23.
. Use of suppression subtractive hybridization to examine the accessory genome of the Liverpool cystic fibrosis epidemic strain of Pseudomonas aeruginosa. J Med Microbiol 2006; 55: 677–688.
. Use of subtractive hybridization to identify a diagnostic probe for a cystic fibrosis epidemic strain of Pseudomonas aeruginosa. J Clin Microbiol 2002; 40: 4607–4611.
. Diversity of the abundant pKLC102/PAGI-2 family of genomic islands in Pseudomonas aeruginosa. J Bacteriol 2007; 189: 2443–2459.
. Identification of a genomic island present in the majority of pathogenic isolates of Pseudomonas aeruginosa. J Bacteriol 2001; 183: 843–853.
. Genetic determinant of pyocin R2 in Pseudomonas aeruginosa PAO. II. Physical characterization of pyocin R2 genes using R-prime plasmids constructed from R68.45. Mol Gen Genet 1983; 189: 382–389.
. Comparative genomic analysis of 18 Pseudomonas aeruginosa bacteriophages. J Bacteriol 2006; 188: 1184–1187.
. Dynamics of Pseudomonas aeruginosa genome evolution. Proc Natl Acad Sci USA 2008; 105: 3100–3105.
. Complete sequence and evolutionary genomic analysis of the Pseudomonas aeruginosa transposable bacteriophage D3112. J Bacteriol 2004; 186: 400–410.
. Sequence of the genome of the temperate., serotype-converting, Pseudomonas aeruginosa bacteriophage D3. J Bacteriol 2000; 182: 6066–6074.
. DNA sequence of the filamentous bacteriophage Pf1. J Mol Biol 1991; 218: 349–364.
. Animal models of chronic lung infection with Pseudomonas aeruginosa: useful tools for cystic fibrosis studies. Lab Anim 2008; 42: 389–412.
. In vivo growth of Pseudomonas aeruginosa strains PAO1 and PA14 and the hypervirulent strain LESB58 in a rat model of chronic lung infection. J Bacteriol 2008; 190: 2804–2813.
. Effect of antibiotic treatment on bacteriophage production by a cystic fibrosis epidemic strain of Pseudomonas aeruginosa. Antimicrob Agent Chemother 2011; 55: 426–428.
. Genomic sequences of bacteriophages HK97 and HK022: pervasive genetic mosaicism in the lambdoid bacteriophages. J Mol Biol 2000; 299: 27–51.
. Mobilization of the Vibrio pathogenicity island between Vibrio cholerae isolates mediated by CP-T1 generalized transduction. FEMS Microbiol Lett 2002; 214: 153–157.
. The effect of a bacteriophage on diversification of the opportunistic bacterial pathogen, Pseudomonas aeruginosa. Proc Biol Sci 2005; 272: 1385–1391.
. Extensive genomic plasticity in Pseudomonas aeruginosa revealed by identification and distribution studies of novel genes among clinical isolates. Infect Immun 2006; 74: 5272–5283.
. Impact of Pseudomonas aeruginosa genomic instability on the application of typing methods for chronic cystic fibrosis infections. J Clin Microbiol 2010; 48: 2053–2059.
. A subtype of a Pseudomonas aeruginosa cystic fibrosis epidemic strain exhibits enhanced virulence in a murine model of acute respiratory infection. J Infect Dis 2010; 202: 935–942.
. Keeping their options open: acute versus persistent infections. J Bacteriol 2006; 188: 1211–1217.
. Evolving stealth: genetic adaptation of Pseudomonas aeruginosa during cystic fibrosis infections. Proc Nat Acad Sci USA 2006; 103: 8305–8306.
. Pseudomonas aeruginosa biofilm formation in the cystic fibrosis airway. Pulm Pharmacol Ther 2008; 21: 595–599.
. Genetic adaptation by Pseudomonas aeruginosa to the airways of cystic fibrosis patients. Proc Nat Acad Sci USA 2006; 103: 8487–8492.
. Pseudomonas aeruginosa microevolution during cystic fibrosis lung infection establishes clones with adapted virulence. Am J Respir Crit Care Med 2009; 180: 138–145.
. Growth phenotypes of Pseudomonas aeruginosa lasR mutants adapted to the airways of cystic fibrosis patients. Mol Microbiol 2007; 64: 512–533.
. Phenotypic changes in Pseudomonas aeruginosa (Psa) populations during exacerbations in adult cystic fibrosis patients infected with non-epidemic strains. Thorax 2010; 65: A123–A123.
. Molecular epidemiology and dynamics of Pseudomonas aeruginosa populations in lungs of cystic fibrosis patients. Infect Immunol 2007; 75: 2214–2224.
. Phenotypic variability of Pseudomonas aeruginosa in sputa from patients with acute infective exacerbation of cystic fibrosis and its impact on the validity of antimicrobial susceptibility testing. J Antimicrob Chemother 2005; 55: 921–927.
. Instantaneous within-patient diversity of Pseudomonas aeruginosa quorum-sensing populations from cystic fibrosis lung infections. Infect Immun 2009; 77: 5631–5639.
. Pseudomonas aeruginosa population biology in chronic obstructive pulmonary disease. J Infect Dis 2009; 200: 1928–1935.
. Detection of a widespread clone of Pseudomonas aeruginosa in a pediatric cystic fibrosis clinic. Am J Respir Crit Care Med 2002; 166: 983–987.
. Genetic analysis of Pseudomonas aeruginosa isolates from the sputa of Australian adult cystic fibrosis patients. J Clin Microbiol 2002; 40: 2772–2778.
. Evidence for spread of a clonal strain of Pseudomonas aeruginosa among cystic fibrosis clinics. J Clin Microbiol 2003; 41: 2266–2267.
. Clonal strains of Pseudomonas aeruginosa in paediatric and adult cystic fibrosis units. Eur Respir J 2004; 24: 101–106.
. Rapid genotyping of Pseudomonas aeruginosa isolates harboured by adult and paediatric patients with cystic fibrosis using repetitive-element-based PCR assays. J Med Microbiol 2004; 53: 1089–1096.
. Phenotypic characterization of clonal and nonclonal Pseudomonas aeruginosa strains isolated from lungs of adults with cystic fibrosis. J Clin Microbiol 2007; 45: 1697–1704.
. Poor clinical outcomes associated with a multi-drug resistant clonal strain of Pseudomonas aeruginosa in the Tasmanian cystic fibrosis population. Respirology 2008; 13: 886–892.
. Clinical profile of adult cystic fibrosis patients with frequent epidemic clones of Pseudomonas aeruginosa. Respirology 2010; 15: 923–929.
. Transcriptome analyses and biofilm-forming characteristics of a clonal Pseudomonas aeruginosa from the cystic fibrosis lung. J Med Microbiol 2008; 57: 1454–1465.
. Gene expression characteristics of a cystic fibrosis epidemic strain of Pseudomonas aeruginosa during biofilm and planktonic growth. FEMS Microbiol Lett 2009; 292: 107–114.
. Comparison of three molecular techniques for typing Pseudomonas aeruginosa isolates in sputum samples from patients with cystic fibrosis. J Clin Microbiol 2011; 49: 263–268.
. Pseudomonas aeruginosa genotype prevalence in Dutch cystic fibrosis patients and age dependency of colonization by various P. aeruginosa sequence types. J Clin Microbiol 2009; 47: 4096–4101.
. Multidrug-resistant epidemic clones among bloodstream isolates of Pseudomonas aeruginosa in the Czech Republic. Res Microbiol 2010; 161: 234–242.
. Pseudomonas aeruginosa transmission is infrequent in New Zealand cystic fibrosis clinics. Eur Respir J 2008; 32: 1583–1590.
. Pseudomonas aeruginosa cross-infection among patients with cystic fibrosis during a winter camp. Pediatr Pulmonol 2000; 29: 177–181.
. Evolutionary dynamics of bacteria in a human host environment. Proc Natl Acad Sci USA 2011; 108: 7481–7486.
. High frequency of hypermutable Pseudomonas aeruginosa in cystic fibrosis lung infection. Science 2000; 288: 1251–1254.
. Hypermutability in environmental Pseudomonas aeruginosa and in populations causing pulmonary infection in individuals with cystic fibrosis. Microbiology 2007; 153: 1852–1859.
. Transmission of Pseudomonas aeruginosa in children with cystic fibrosis attending summer camps in the Netherlands. J Cystic Fibros 2008; 7: 30–36.
. Risk of cross-colonization and infection by Pseudomonas aeruginosa in a holiday camp for cystic fibrosis patients. J Clin Microbiol 1995; 33: 572–575.
. Typing of Pseudomonas aeruginosa strains in Norwegian cystic fibrosis patients. Clin Microbiol Infect 2001; 7: 238–243.
. Epidemic strains of Pseudomonas aeruginosa in adult CF patients in Ontario, Canada – prevalence and epidemiology. Pediatr Pulm 2008; [Epub ahead of print DOI: 10.1007/s10096-011-1483-8].
. Epidemiology of Pseudomonas aeruginosa in cystic fibrosis in British Columbia, Canada. Am J Respir Crit Care Med 2002; 166: 988–993.
. Spread of a multiresistant strain of Pseudomonas aeruginosa in an adult cystic fibrosis clinic. Lancet 2001; 358: 557–558.
. Identification of DNA markers for a transmissible Pseudomonas aeruginosa cystic fibrosis strain. Am J Respir Cell Mol Biol 2005; 33: 56–64.
. Inflammatory markers in cystic fibrosis patients with transmissible Pseudomonas aeruginosa. Eur Respir J 2003; 22: 503–506.
. Identification of airborne dissemination of epidemic multiresistant strains of Pseudomonas aeruginosa at a CF centre during a cross infection outbreak. Thorax 2003; 58: 525–527.
. Transmission of colistin-resistant Pseudomonas aeruginosa between patients attending a pediatric cystic fibrosis center. Pediatr Pulmonol 2002; 34: 257–261.
. A major Pseudomonas aeruginosa clone common to patients and aquatic habitats. Appl Environ Microbiol 1994; 60: 1734–1738.
. Microevolution of the major common Pseudomonas aeruginosa clones C and PA14 in cystic fibrosis lungs. Environ Microbiol 2011; 13: 1690–1704.
. Development of a diagnostic test for the Midlands 1 cystic fibrosis epidemic strain of Pseudomonas aeruginosa. J Med Microbiol 2006; 55: 1085–1091.
. Random amplified polymorphic DNA typing of Pseudomonas aeruginosa isolates recovered from patients with cystic fibrosis. J Clin Microbiol 1996; 34: 1129–1135.
. Application of different genotyping methods for Pseudomonas aeruginosa in a setting of endemicity in an intensive care unit. J Clin Microbiol 1999; 37: 3654–3661.
. Multiple-locus variable-number tandem-repeat analysis for longitudinal survey of sources of Pseudomonas aeruginosa infection in cystic fibrosis patients. J Clin Microbiol 2007; 45: 3175–3183.
. Evaluation of a nine-locus variable-number tandem-repeat scheme for typing of Pseudomonas aeruginosa. Clin Microbiol Infect 2010; 16: 1111–1116.
. Rapid single-nucleotide polymorphism-based identification of clonal Pseudomonas aeruginosa isolates from patients with cystic fibrosis by the use of real-time PCR and high-resolution melting curve analysis. Clin Microbiol Infect 2011; 17: 1403–1408.
. Diagnostic multiplex PCR assay for the identification of the Liverpool, Midlands 1 and Manchester CF epidemic strains of Pseudomonas aeruginosa. J Cystic Fibros 2008; 7: 258–261.
. Isolation measures for prevention of infection with respiratory pathogens in cystic fibrosis: a systematic review. J Hosp Infect 2006; 64: 1–6.
. A reducing prevalence of the Liverpool epidemic strain of Pseudomonas aeruginosa in children attending the index paediatric clinic. Pediatr Pulm;2009: 325–325.
. Effect of a rational cross-infection control policy on the spread of a transmissible Pseudomonas aeruginosa strain. Thorax 2009; 64: A109–A109.
. Effects of segregation on an epidemic Pseudomonas aeruginosa strain in a cystic fibrosis clinic. Am J Respir Crit Care Med 2005; 171: 1020–1025.
. Australian epidemic strain Pseudomonas (AES-1) declines further in a cohort segregated cystic fibrosis clinic. J Cystic Fibros 2012; 11: 49–52.
. Pseudomonas aeruginosa in cystic fibrosis: cross-infection and the need for segregation. Respir Med 2001; 95: 147–152.
. Heterogeneity of Pseudomonas aeruginosa in Brazilian cystic fibrosis patients. J Clin Microbiol 2001; 39: 3976–3981.